Sifting through the one hundred or so submissions for this prize to honor comparative literary scholarship and thinking with a literary- historical emphasis, the committee was impressed with the wealth and range of very fine and innovative work. At the end of the day the difficult decision came down to one distinguished book, which eked out a number of excellent studies, all of which, to our surprise, shared a turn or return to the question of aesthetics. 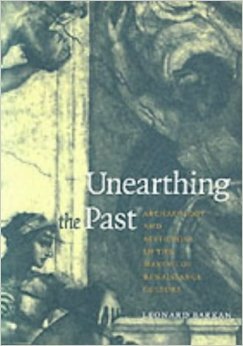 The prize goes to Leonard Barkan's Unearthing the Past: Archaeology and Aesthetics in the Making of Renaissance Culture, published, and splendidly illustrated, by Yale University Press. It is a work of deep learning and incisive observation. A long time in the making, Unearthing the Past clearly profited from a certain patience and "labor of the negative". Barkan interrogates the complicated aesthetic and historical issues at stake in the recovery and understanding of ancient works of art, all of which are mediated in and by literary, discursive, and institutional networks. Barkan's work is profoundly attentive to historical forces without, however, historicizing his objects of study to death. Indeed, his work does justice to the mobility of history and the impossibility of consigning works of art to a single, homogenous moment of the past. At the same time, he performs in exemplary fashion the sometimes lost art of interpretation--strengthened by his admirable command of materials in several disciplines--even as he attends to the pressures brought to bear on interpretation in and of the Renaissance. To the mind of the committee, Barkan's work emerged as the leader of a pack of impressive works, which also engaged the question of aesthetics in historical terms, though often not to the exclusion of what is called"theory." Honourable mention goes to Ulrich Baer's Remnants of Song: Trauma and the Experience of Modernity in Charles Baudelaire and Paul Celan, Didier Maleuvre's Museum Memories: History, Technology, Art, David Ferris' Silent Urns: Romanticism, Hellenism, Modernity, all from Stanford University Press, and Richard Helgerson's Adulterous Alliances: Home, State, and History in Early Modern Drama and Painting, published by the University of California Press. Given the high quality of these works, themselves prize-worthy, it is all the more remarkable that the committee could settle with unanimity on the particular excellence of Leonard Barkan's Unearthing the Past. This occasion fills me with many pleasures and one regret. The regret, of course, is that I cannot be present to bask in approbation, to delight in intellectual fellowship, and to express my gratitude in person. As for the pleasures, first of all, the satisfaction of being selected as winner of a prize with such grand tradition behind it and in the company of so many remarkable and deserving contenders. Second, I am especially gratified that the committee recognized--both in my book and in the other splendid works named in the citation--a newly invigorated intellectual focus on the Aesthetic. But most of all, I want to express my pleasure in Comparative Literature itself. For much of my career, my official home has been in an English Department. Yet from the very beginning I had a wandering eye--and not only toward Art History. My graduate diplomas say "English" on them but my mentors were individuals like Tom Greene, Bart Giamatti and (briefly) even Harry Levin himself. My first job was in a Literature department (at UCSD), and though I did some kicking and screaming, I came to realize later that everything about my future career was enabled by the privilege and necessity of teaching all over the map. Now, for the first time I am leaving the word "English" out of my title altogether as I become Professor of Comparative Literature at Princeton. Thanks to your generous recognition of Unearthing the Past--which really means your receptivity to a broadly defined cultural field, not bounded by traditional limits of geography and disciplinarity--I hear Comp Lit saying to me, "Welcome home."